The trio have been singing together since they boarded in the 1970s as students at St MacNissi's College, Garron Tower, County Antrim. After signing a deal with Sony BMG in April 2008, their eponymous debut album was recorded in Northern Ireland and Rome, with the unusual honour of having been allowed to record in St Peter's Basilica in the Vatican. The Priests have now recorded three additional albums and written a book recounting the story of their musical journey together. To date they have sold 3.5 million records worldwide. Their albums and performances have received rave reviews, and not just in the pages of The Catholic Herald or other publications where a degree of bias might be suspected. Much of the earnings from their best selling albums is directed to charitable causes and the three priests continue to carry out the daily duties of parish priests among their communities. 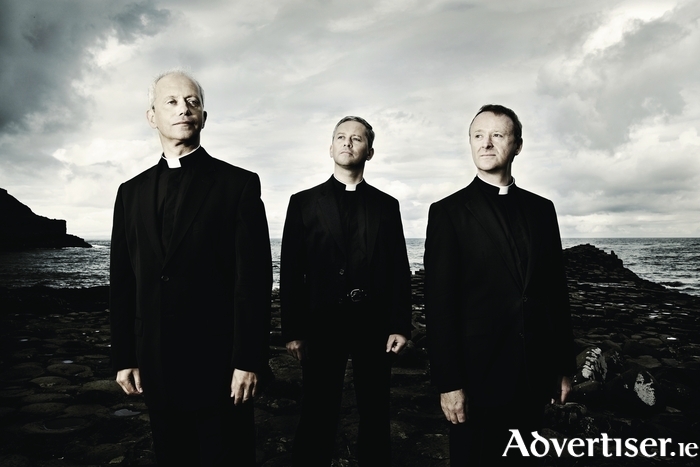 Ahead of their Galway concert, Fr Martin O’Hagan took time out to talk about the group’s work. I began by asking about the progress of the biographical film about the trio which has been in the pipeline for the past few months. As regards his own priestly vocation, did the fact his elder brother Eugene go into the priesthood influence Martin’s decision to do the same? While most of The Priests’ repertoire consists of familiar classical material, their second album, Harmony, featured their own compositional debut ‘King of Kings’. Might this be a path they would like to explore further? People attending the concert must be seated by 7.45pm for an 8pm start. Tickets are €25 for main nave and €15 for side and back naves, and are available now at the Cathedral Book Shop and Parish Office.